Like Gummo Marx, Willie Delahanty is the forgotten member of a famous brothers act. A decidedly lesser talent, the youngest Delahanty never scaled the professional heights attained by his five ball playing siblings or garnered the public attention accorded them. About the only distinction that can be claimed by Willie is the fact that he is the only Delahanty brother without an entry in the major league record book. Unlike Ed, Tom, Joe, Jimmy, and Frank Delahanty, Willie spent his entire career as a minor leaguer. But as family histories later told it, only crippling circumstance stymied Willie’s ascension to the majors. In one of various tellings, he had been drafted by Brooklyn and was awaiting imminent call-up when a near-fatal beaning brought his career to an abrupt end. In another, an eye injury caused by misadventure with a Fourth of July firecracker ended Willie’s playing days. As is usually the case, the truth is more prosaic. Undersized and lacking his brothers’ athletic gifts, Willie simply was not good enough. And he never came close to being a major leaguer, spending his pro years entirely with mid-level minor league clubs before abandoning the game at the close of the 1912 season. William John Delahanty was born in Cleveland on February 28, 1885,1 the tenth and final child born to stevedore James Delahanty (1842-1919) and his wife, the former Bridget Croke (1849-1926).2 His parents were Irish-Catholic immigrants who arrived separately in Canada, met and married in Buffalo, and then moved to Cleveland where James pursued work on the Lake Erie docks. The ever-increasing Delahanty family settled in a large, two-story wooden frame house, where the formidable Bridget Delahanty ruled the roost. The Delahanty home was located close to a large vacant lot where amateur baseball was played constantly. Much to Bridget’s displeasure, Edward, her oldest and favorite son, quickly made his mark on that sandlot and soon thereafter embarked upon a pro baseball career. In time, younger brothers Tom, Joe, Jimmy, and Frank followed Ed’s example. When his turn came, Willie followed suit. He left high school after his sophomore year and awaited the inevitable call of professional baseball. But before Willie started his career, he would play a minor role in the central tragedy of the Delahanty family. In July 1903, two-time major league batting champ Ed Delahanty was a member of the American League Washington Senators and still capable of Hall of Fame-type performance on the field. But off it, his life, beset by marital woes, contract controversy, and heavy drinking, was spinning out of control. Concerned about Ed’s increasingly erratic behavior, club officials sent for Bridget Delahanty, the one person who might be able to straighten him out. Accompanying Mrs. Delahanty on the trip to Detroit [where the Senators were finishing a long road trip] was her youngest son Willie and a matronly cousin. Ed was 18 years older than Willie and had been out of the house when the teenager was growing up. But Willie, like his other brothers, idolized Ed, and gladly made the trip to Detroit. Upon arrival, Mrs. Delahanty gave her wayward son a good talking-to at the club’s hotel, and Ed promised to reform. With the situation seemingly improved, Willie accompanied Senators players to the ballpark for the final game of the road trip, while his mother and cousin visited a nearby spa. Briefly left on his own, Ed slipped out of town and began a fateful train trip East. Subsequently put off the train for disorderly behavior, he was last seen walking on the International Bridge, the railway passage spanning the watery divide between the United States and Canada. Some six days later, the bloated and lifeless body of Ed Delahanty was pulled from the river below Niagara Falls.3 Ed’s funeral, which Willie and all the other surviving Delahanty brothers, save Tom [then playing in faraway Denver] attended, was a somber affair, imparting an indelibly sad memory upon family members. The following season, Willie returned to Mansfield, but not before exchanging bitter words with club management. According to Willie, the club had reneged on assurances previously given to him, and he vowed never again to wear a Mansfield uniform. 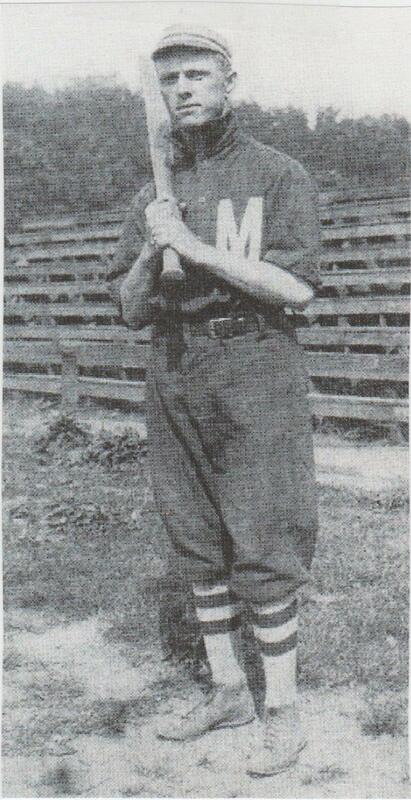 The club responded by informing Willie that, if he did not play for Mansfield that season, he would not play anywhere in Organized Baseball.15 The matter was resolved in time for Delahanty to play 103 games for Mansfield in 1907. His batting average tailed to .225, while a .916 FA ranked him middle-of-the-pack among circuit shortstops. Problems, however, resurfaced before the campaign ended, and Willie left the club. Suspended by Mansfield, he finishing the year playing semi-pro ball back in Cleveland. Willie needed to keep his suitcase packed in 1909, as he bounced between teams in the New York State League and another Class B circuit, the Tri-State League. He began the campaign with Wilkes-Barre, but was then traded to a NYS League rival, the Binghamton Bingoes. “Delahanty will no doubt be delighted with the transfer,” reported the Wilkes-Barre Times-Leader. With Binghamton, “he will be able to play regularly instead of being on the bench one day, the next day in the outfield and then in the infield, as has been his experience as a Baron.”20 He got off well with his new club, getting “three safe bingles” in his initial game as a Bingo.21 But Willie’s stay in Binghamton lasted barely a month. By the end of June, he was in another circuit, making his debut for the Harrisburg Senators of the Tri-State League by playing center field and going 1-for-4 in a 6-2 loss to Johnstown.22 Little more than a week later, Harrisburg rescinded the Delahanty purchase and shipped him back to Binghamton.23 In his two stints with the Bingoes that season, Willie played in 25 games, batting a soft .225.24 His numbers elsewhere that season are lost. Despite the good showing of the previous season, Willie’s pro career was nearing its end. In 1912, he turned in a brief tour of duty with the Zanesville (Ohio) Potters of the Class B Central League. In 13 games, he batted .222 (10-for-45) with six stolen bases, and posted a .927 FA at second base. But sometime after an appearance on June 27, Willie was dropped from the club.33 No other placement for him during the 1912 season has been found. With his 28th birthday on the horizon and with no realistic prospect of ever rising above Class B ball, Willie thereafter called it quits, leaving unfulfilled the hope that he would become the sixth Delahanty brother to wear a major league uniform. At the time, it was reported that an arm injury had hastened Willie’s retirement from the game.34 Years later, the Waterbury beaning of May 1910 was converted into a career-ender.35 Willie’s 1957 obituary then embellished this tale to include his draft and imminent call-up by the Brooklyn Dodgers at the time of the beaning incident.36 Not to be outdone, brother Frank, the last survivor of his generation of Delahantys and a shameless story teller, invented a whopper. In 1963, Frank told the Cleveland Plain Dealer that “Willie would have made it [to the majors] too. He was in the New England League when he lost an eye. He was sitting on the front porch of the team hotel on the morning of July 4, and someone exploded a firecracker. It got Willie.”37 Although Frank’s story has been debunked – Willie’s daughter Katherine Delahanty Krysiak later stated that her father had no vision problems and did not even wear eyeglasses until he became elderly38 – the exploding firecracker myth has proved an enduring one, embraced even by respected baseball historians.39 But the truth of the matter has nothing to do with beanings or firecrackers. While it is certainly no disgrace, Willie Delahanty never became a major leaguer for an elementary reason: he was not a good enough player. Once he left the game, Willie returned to his parents’ home in Cleveland and receded into the obscurity of private life. His World War I draft registration card lists his occupation as a saloonkeeper at Delahanty Brothers, the neighborhood tavern that he opened with his brother Joe. When Prohibition came, the business was converted into a restaurant. Willie, meanwhile, took a job as an office bookkeeper. In 1923, the long-time bachelor married, taking Clevelander Helen Weber (1886-1964) as his bride. The birth of children William Thomas (1923-1992) and Katherine (1927-2007) completed the family. Although no longer living at the Delahanty homestead, Willie was a Cleveland resident for the remainder of his life. The 1930 US Census lists Willie’s occupation as “helper at a Commission House.” Ten years later, he was working as a crew supervisor on road improvement projects, a post likely doled out by brother Frank, the Cleveland streets commissioner. By 1942, Willie had moved on to employment with the National Bronze Aluminum Foundry Company.40 His final working years were spent in the employ of a local aircraft company.41 As he grew older, Willie developed heart disease. On October 16, 1957, William J. Delahanty died at Fairview Park Hospital in Cleveland. He was 72.42 Following a Funeral Mass at St. Angela’s Church, Willie was interred near his parents and various siblings in Calvary Cemetery, Cleveland. Survivors included his wife, Helen, children Bill and Katherine, his sister, Katherine Delahanty Maguire, and his brother Frank. Now decades later, his fate seems secure. Minor leaguer Willie will likely remain the forgotten Delahanty brother in perpetuity. Note: This bio is adapted from an article published in the February 2015 issue of "The Inside Game," the SABR Deadball Era Research Committee newsletter. The primary sources for the biographical detail provided herein are Jerrold Casway, Ed Delahanty and the Emerald Age of Baseball (South Bend, Indiana: University of Notre Dame Press, 2004), and certain of the newspaper articles noted below. Unless otherwise noted, statistics have been taken from Baseball-Reference. 1. Some sources give Willie’s birth year as 1886. But 1885 accords with various US Census data, Delahanty family tree postings on Ancestry.com, and Willie’s October 1957 obituary. A February 28, 1885 birth date is also the one that Willie himself provided under oath to WWII draft authorities. 2. Willie’s elder siblings were Edward (born 1867), Thomas (1872), Katherine (1874), Joseph (1875), James (1879), Florence (1880), and Frank (1882). Two other Delahanty children, an unknown female (born 1866) and Martin (1868), did not survive infancy. 3. For more detail on the events that immediately preceded Ed Delahanty’s death, see the definitive biography by Jerrold Casway, Ed Delahanty and the Emerald Age of Baseball (South Bend, Indiana: University of Notre Dame Press, 2004), 264-265. See also, Mike Sowell, July 2, 1903: The Mysterious Death of Hall-of-Famer Big Ed Delahanty (New York: Macmillan, 1992), 255-280. 4. In 1894, Hamilton (.403), Ed Delahanty (.404), and Sam Thompson (.415) formed the only .400 hitting outfield in major league history. At times, however, Ed played elsewhere so that the Phillies could get the bat of outfielder Tuck Turner (.418 in 347 at-bats) into the lineup, as well. 5. As reported in Sporting Life, January 23, 1904, the Washington (DC) Evening Star, March 2, 1904, and the Rockford (Illinois) Republic, March 4, 1904. 6. In their younger days, the Delahantys were handsome men who shared common features. Years later, Hall of Famer Clark Griffith remembered that the Delahanty boys all looked alike and that there were “about 73 of them.” See Sowell, 116. In addition to their looks, the brothers shared a deep reverence for their mother, despite her disdain of baseball. 7. Washington Evening Star, March 2, 1904. Another newspaper raised Willie’s height to 5’ 8½”. See the Rockford Republic, March 4, 1904. 8. Casway, 290, as per a February 5, 1993 telephone conversation between daughter Katherine Delahanty Krysiak and the author. 9. Springfield (Massachusetts) Republican, April 14, 1904. 10. Sporting Life, May 7, 1904 [which misidentifies him as young Frank Delahanty]. 11. Sporting Life, May 14 and June 11, 1904. 12. Sporting Life, June 29, 1904. A subsequent report had Willie playing that summer in Oswego. See Sporting Life, March 25, 1905. 13. See e.g., the Montgomery Advertizer, December 27, 1905, Cleveland Plain Dealer, December 30, 1905, and Richmond Times-Dispatch, January 4, 1906. 14. Unless otherwise noted, Delahanty's stats have been taken from Baseball-Reference.com. 15. Cleveland Plain Dealer, March 17, 1907. 16. Wilkes-Barre (Pennsylvania) Times-Leader, February 5, 1908; Washington Evening Star, February 12, 1908. 17. Sporting Life, October 8, 1908. 18. Sporting Life, April 18, 1908. Tom and Joe Delahanty were quiet, laid back men. The other Delahanty brothers, including Willie, were high strung and frequently a headache for the clubs they played for. 19. Cleveland Plain Dealer, October 23, 1908. 20. “Binghamton Buys Bill Delahanty from Barons,” Wilkes-Barre Times-Leader, May 27, 1909. 21. Wilkes-Barre Times-Leader, May 31, 1909. 22. Harrisburg (Pennsylvania) Patriot, July 1, 1909; Wilkes-Barre Times-Leader, July 2, 1909. 23. Wilkes-Barre Times-Leader, July 8, 1909. 24. Baseball-Reference provides only Delahanty’s batting stats for Binghamton. Published Tri-State League fielding records indicate that Willie played error-less ball during his 11-game tenure as a Harrisburg outfielder, as per Sporting Life, January 29, 1910. 25. Sporting Life, March 12, 1910. 26. Sporting Life, April 16, 1910, and the Cleveland Plain Dealer, April 17, 1910. 27. Springfield Republican, May 8, 1910. See also, Sporting Life, May 21, 1910. 28. Springfield Republican, May 21, 1910, and Sporting Life, June 4, 1910. 29. Cleveland Plain Dealer, October 27, 1910. 30. Charleston’s acquisition of Delahanty was reported in the Macon (Georgia) Telegraph, May 15, 1911. 31. Delahanty’s tour of duty in Columbia began May 17, 1911, as per the Columbia (South Carolina) State, May 18, 1911. 32. As per the 1912 Reach Guide, p. 385. 33. The newsletter article on which this bio is based mistakenly placed Willie back in Wilkes-Barre for part of the 1912 season. Thanks to Ed Washuta for pointing out that Joe, not Willie, was the Delahanty brother playing for the Barons in 1912, and for locating Willie on the roster of the Zanesville (Ohio) Potters. The Zanesville stats for Willie appear in the 1913 Spalding Guide, pp. 219-220. 34. See E.D. Soden, “The Greatest Baseball Family in the History of the Game,” Baseball Magazine, Vol. IX, No. 5, (September 1912), 20. 35. See Ed Bangs, “Famous Families of the Game – The Delahantys,” The Sporting News, November 6, 1946, 13. 36. See obituary for William J. Delahanty, Cleveland Plain Dealer, October 18, 1957. 37. See Hal Lebovitz, “Delahanty ‘Tragic Jumper,’ Brother Recalls,” Cleveland Plain Dealer, May 26, 1963. 38. Casway, 348, n. 2. 39. See e.g., Sowell, 306-307. 40. As per the WWII draft registration form completed by William J. Delahanty. 42. See again, the obituary published in the Cleveland Plain Dealer, October 18, 1957. Same states: “After he was obliged to withdraw from baseball, William entered the graphic arts trade.” Actually, his late brother Joe Delahanty was the family member who worked in graphic arts.